Our new 3 gram foil packs of all-organic, sustainably produced 50x extracts are unlike anything else we've ever offered. After countless experiments, we crafted powerful single plant, full spectrum resins as well as extremely potent blends of some of the most famous entheogens available today. Our 50x Full Spectrum extracts are a proud offering of our shop and have already become Top Sellers here in the short time they've been available. 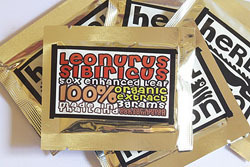 Leonurus sibiricus is a plant that has been steadily gaining in popularity recently, and is often overlooked. It's been used for thousands of years for its intense and relaxing smoke, and now it's available as a concentrated, full spectrum resin smoking blend.